Winter Wonderland, that is not always your pooches reaction when out for a walk on a nice snowy day. With those big flakes comes a whole new list of things to consider when caring for your pets well-being. One of the biggest threats is the salt used to melt ice on driveways, roads and sidewalks . One of the areas we frequent for our walks, is a school, they are very conscientious about making sure their sidewalks and driveways in no way, shape or form, are slippery! As my posse crossed over a busy intersection this morning and reached the other side I instantaneously had three dogs limping, each one with a paw pulled up. It is amazing how fast salt can irritate an animals feet and prolonged contact can lead to chemical burns that damage their pads. If your dog is limping on a walk, de-icing products are most likely the culprit. 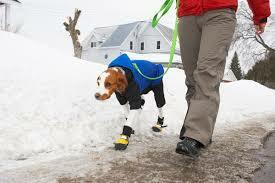 A few ideas one can try, to minimize the pain and degradation of their pets feet, are booties or paw balm. There are lot’s of products out on the market that are available and some work better than others. I found a roll-on product at the Health Food store that helps the boys combat the soreness experienced by salt. What do you do though when you are already out and an issue arises…if your pooch is small, picking it up and carrying it can be an option, but not all four legged friends are portable! 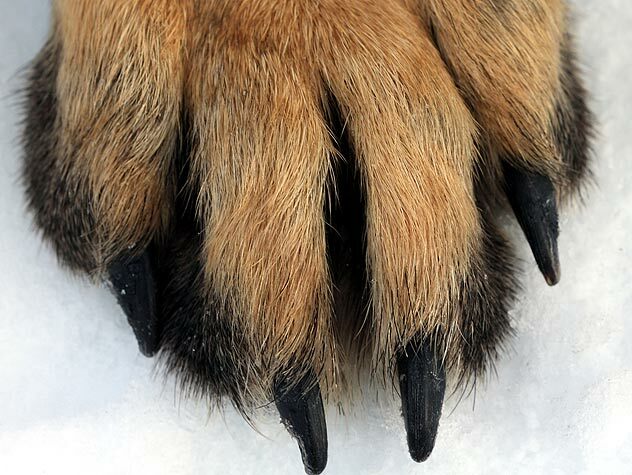 If your pet starts raising a foot, try to find a pristine patch of snow to walk into and then use a mitt and rub the bottom of their paw pads which should give them immediate relief. Walking in the woods is usually the best place to go to avoid pesky salt issues, but not everyone has something like that at their disposal. Try to use a boot or foot balm to protect their feet and avoid major arteries that are heavily salted. The snow can be a lot of fun for you and your dog, be prepared and mindful where you are walking so that you both can enjoy your daily adventures!